Roasting vegetables in the oven is a fast and easy way to use vegetables when you aren’t sure what to do with them. Roasting brings out a vegetable’s sweetness and juice, and you may be surprised to learn that you like a previously hated veggie when roasted instead of raw or steamed. 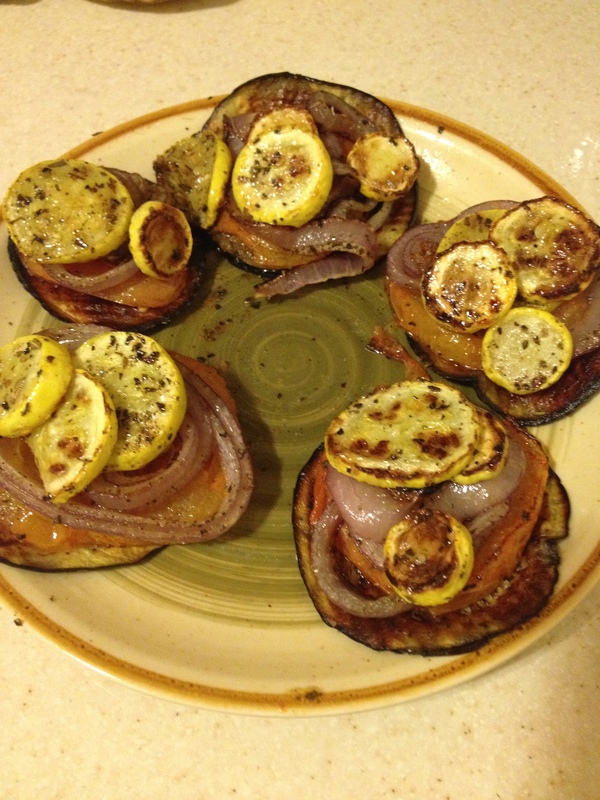 For this example, I roasted eggplant, summer squash, tomatoes, and red onions, but you can roast any vegetables you have in your $2 bag. Wash and slice your veggies. Be aware that veggies shrink slightly when roasted, so cut a little more than you think you’ll want. Pour a small amount of oil onto a small plate. Lightly dip each side of the veggie slices in the plate of oil, shake off any extra oil, and place on cookie sheet or baking dish without overlapping the slices. Sprinkle seasonings across the veggie slices. For this example, I used salt, pepper, oregano, and basil. If using salt, use a very, very light sprinkle in order to keep the recipe healthy. You can use any combination of seasonings you like. Place in oven and let cook for about 15 minutes or until you start to smell the veggies. Cooking time varies by veggie type and thickness. After about 15 minutes, flip the veggies over using a spatula and let cook about another 15 minutes. Check on them about every 5 minutes to make sure they don’t burn. Veggies are done when they have brownish, crispy edges and soft middles. To make the stackers shown here, just stack the veggies from biggest slice to smallest slice and arrange them to look pretty. No-Guilt Banana Ice Cream	Bake…Don’t Fry!